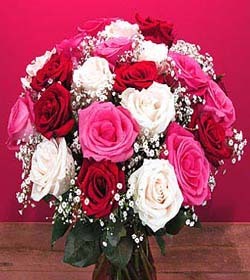 2 Dozen Roses in a rainbow of colors arrive beautifully arranged with greens in a vase. Colors may vary. For provincial area: Your flowers will arrive boxed and ready for the recipient to arrange in their own special way.